With a private cooperation putting in about $142-million dollars Gaillard Center, here in Charleston Sc , is now completed. Located between Calhoun street and George Street parallel to East Bay lies this amazing architectural building that compass a world class performance hall from the European opera house. As well it is it offers exhibition hall featuring 3 ballrooms and a grand ballroom. Along with that four prefunction rooms, and four salon rooms. With it artistic design it is one venue that will booked quite frequently by brides to be. The interior of the Gaillard Center, here is Charleston Sc, features 2 grand staircase on the first floor along with two amazing spiral wooden staircase on the second and third floor. I had the honor to capture this amazing bride to be for her bridal portrait there for a wedding competition. As always asking permission is very important for any venue, not only out of respect, but to make very sure the over all experience from your clients is flawless and enjoyable. This image is stunning, artistic and with great lines, we were graciously loaned this amazing wedding dress designed by Hayley Paige, provided by Jodi Of White on Daniel Island. We had an amazing team of two more very talented individuals ladies to include Jeannine Mariotti of Make Up by Jeannine, also included was Haley from Hermosa Jewelry who designs incredible jewelry for brides. As to deciding where to capture this and having the perfect theme to represent it all including the Gaillard Center as a wedding photographer, we took many factors into consideration. While walking up the stairs and with help from Haley this seem to be the perfect angle and look we were looking for. Truly a timeless image like a fairytale coming to life. 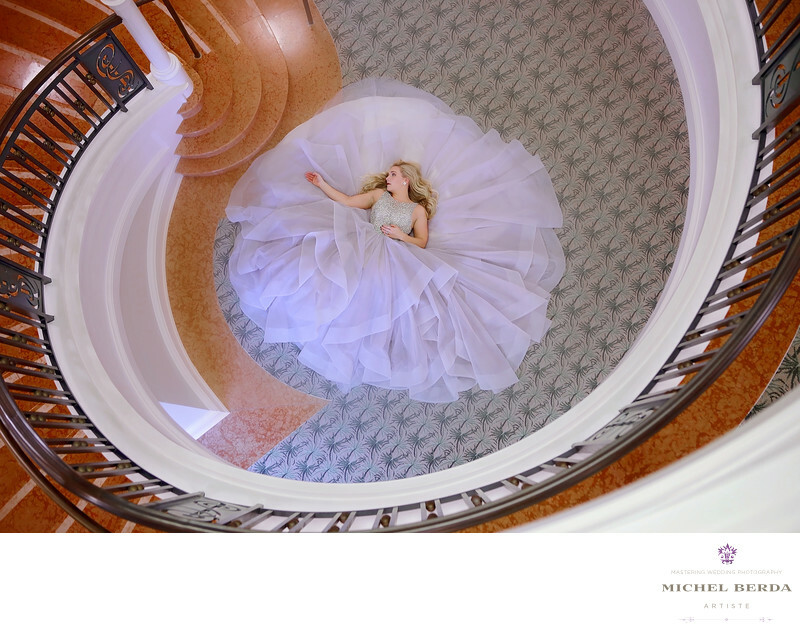 Keywords: Bridal Portrait Photographer (84), Charleston Gaillard Center (3), Hayley Paige (15), Hermosa Jewelry (3), Jeannine Mariotti (3), Staircase (6), Wedding Dress (3).